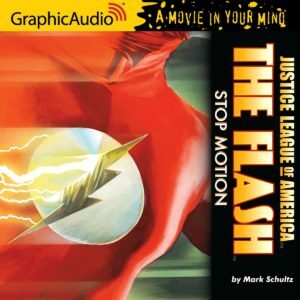 I’m not big on audiobooks, but I picked up a DC Comics-related Humble Bundle a few weeks ago and I “read” The Flash: Stop Motion by Mark Schultz. It’s kind of odd listening to a “Graphic Audio” adaptation of a prose novel based on a character who usually appears in visual media, but the full cast, sound effects, and music help to make up for the lack of actual visuals that I’ve found tends to hamper prose stories about superheroes. I read the book when it came out in 2004, and I’d forgotten enough for it to be more-or-less “new.” It’s set during the Wally West/Keystone City era when the Flash’s identity was still public knowledge and he worked with Detectives Chyre and Morillo. A super-speed killer has been attacking people in the Keystone/Central area. Not only is it faster than the Flash, but every time it strikes, bits of other universes bleed into our own. Wally has to discover the nature of this “superluminoid,” its surprising connection to the West/Allen family, and unlock a potential beyond the speed force in order to stop it. The familiar characters are handled well, and the concepts behind the superluminoid, quantum warriors and the Seventh Singularity are intriguing. It’s the kind of thing you’d expect from Grant Morrison or Warren Ellis as they take on super-speed, the metagene, the speed force and quantum physics. The ideas still hold up, and I think it would be fascinating to explore them further, though in the long run they would unbalance the Flash’s already over-powered abilities. The audio adaptation works well. It’s got a full voice cast and sound effects in addition to the narration. Some of the voices work better than others, and some just don’t fit my head-voice for the characters. (Chyre, for instance, sounds more gravelly and world-weary in my mind than this version.) They really make use of effects and music in the battle sequences, though some of them might work better with headphones than listening in a car. I found it hard to pick out the words in the action scenes because there was so much going on. And some of the conversations that work in print go on way too long in audio. The novel is worth reading, and the audio is worth listening to. Now I’m curious to hear how Graphic Audio adapted Infinite Crisis, 52 and Final Crisis. I think I’ll skip Countdown, though. This entry was posted in Reviews and tagged Books, Mark Schultz, Seventh Singularity, Stop Motion, Superluminoid, Wally West on August 10, 2018 by Kelson.